This will likely be the last post of the year for me. I am going out of town next week for Christmas, and won't really be able to post much. I had this great plan to go way in depth about Florida, but when I started to research them, I realized that I soon rather go to the dentist than break down Michigan's bowl game. Lloyd is done, all his assistants are fired, the era of Michigan football as we know it has come to an end. Not much else to report. 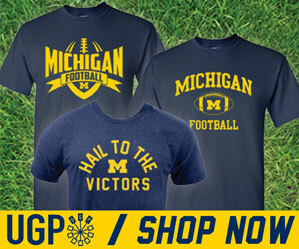 I will however, end this...my maiden season as a Michigan blogger, with a story. A story that has literally nothing to do with Michigan, football, or sports for that matter. I heard this story while listening to ESPN radio while I was out and about yesterday. Neil Everett, a Sports Center anchor, took 30 seconds of ESPN advertising air time to tell the story of a soldier and a military dog who were recently killed in Iraq. The story instantly caught my attention. A year ago, my wife and I got our first dog together...a Siberian Husky/German Sheppard mix named "Bo"...yeah...after that Bo. Cpl. Kory D. Wiens, was a 20 year old soldier from Dallas, Oregon. Wiens belonged to the 94th Mine Dog Detachment, 5th Engineer Battalion, 1st Engineer Brigade stationed in Fort Leonard Wood, Missouri. Up until about two months ago, I knew nothing about military dogs. But after reading an amazing book called From Baghdad, With Love, I found that not only are dogs depended for their amazing instincts and sense of smell, but they are often highly trained dogs who work right along young men and women on the front lines of battle. These dogs, usually Sheppards or Retrievers, are relied upon to help sniff out bombs and traps. And in the most heated instances, to help engage the enemy and subdue them. When dogs go off to war, they are first rigorously trained for months in the US. Then they are partnered with a soldier who becomes their everything...guardian, teammate, comrade, best friend. They are together at all times. They are never apart. Much like a K9 and a police officer...these two never partner with anyone else. They go into battle together, eat together, live together and sleep together. Cpl. 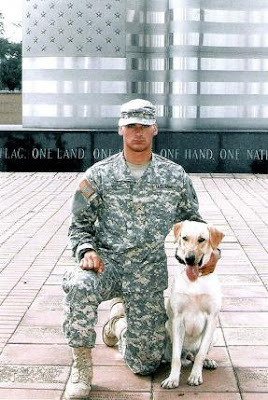 Wiens and his Labrador retriever partner, Cooper, were killed by a IED (improvised explosive device) in Muhammad Sath, Iraq on July 6th. They were the first soldier and companion dog to be killed since the Iraq war began. The Army has 578 dog teams serving rotations in both Iraq and Afghanistan. Cooper and Cpl. Wiens were in Iraq since January. Both Wiens and Cooper were honored in a special ceremony at their base in Fort Leonard Wood, Missouri on Tuesday this week. Hearing this story on the radio, and then reading about it online...this really makes everything that we discuss on here...coaching searches, controversies, who's better than who. It all seems so meaningless. It's like...what's the point? But it's important to understand that it's just sports. It's all just a game. When it comes down to life and death, this is the story of a real team. A man and a dog...both serving their country, serving each other, and gave what Abraham Lincoln called "The last full measure of devotion". At this time of year, when so many young men and women won't be able to come home to see their friends and families, think about them when you sit down to Christmas dinner, watch a bowl game, or go out to meet with friends. These are the true heroes...the best role models. We owe them a debt of gratitude. It's guys like Cpl. Wiens and his friend Cooper that make it possible for people like me and you to come on here, post our opinions, and enjoy sports the way we do. You Said You Like Video?? ?